Peter Richard Conte dazzles with his flair for the Fox Touch in this rafter-shaking collection of Heavy Organ favorites. Included are works by Bach, Reubke, Sir Arthur Sullivan, Mulet, Elmore, Hebble and Fauré! 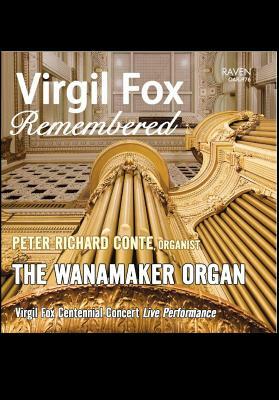 Recorded live at the sellout 2012 Virgil Fox Memorial Concert, using the Friends of the Wanamaker Organ state-of-the-art audio equipment. Accompanying booklet includes essays and a complete specification. Wrote Choir and Organ in its glowing 4-Star review: Once again, the brilliant Conte demonstrates his unmatched mastery of the enormous and complex resources of this great ‘one-off’. Everything is translated aptly into the organ’s vernacular, from Bach’s Toccata in F to Reubke’s Sonata (with the ﬁnal fugue really hair-raising in a Stokowskian kind of way). The 117-rank string division relishes Fauré, Elmore and Hebble while Fox’s signature Bach transcription Komm, süsser Tod, conceived in detail for the Wanamaker instrument, provides the ﬁtting conclusion. A must for Fox fans? Perhaps; but while Conte absorbs some of Fox’s stylistic idiosyncrasies (for the occasion? ), the histrionics are kept at bay, even if the tempi sometimes prompt the fur to fly. A heretical thought perhaps for Fox’s admirers, but Conte is surely a greater artist.